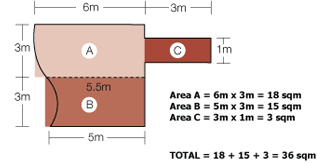 Concrete areas are not always square, so it is best to break the area up into smaller rectangular areas and then take the average widths. Here are a couple of examples. If you’re still unsure about your measurements, you can call us on 1300 Driveways and we will arrange a free onsite measure and quote. Complete this form for an instant quote! Very happy with the quality of our concrete. We’ve had family members and other trades request the details of 1300 Driveways. Communication from Michael throughout the whole process was fantastic... Price wise you definitely got what you paid for and would highly recommend 1300 Driveways. I was extremely happy with the work undertaken by 1300 Driveways. It was a relatively small job of filling in the gap between two drive strips. We chose a contrasting colour and the finished job looks amazing. I have no hesitation is recommending 1300 Driveways!